I looked behind me and couldn’t see my tracks. A glance in front revealed nothing but wind-swept snow. How had I gotten myself into this mess? I had no idea where the trail was. I started to breathe harder as panic washed over me. Then I chuckled, thinking how bad will this look — to have a Park Ranger lost while out hiking in the snow? I’m better than this — I advise visitors all the time about changing weather conditions. Ok, settle down, pull out your map, and figure this thing out. The day had started innocently enough, with a drive from southwest Oregon down to Mt. Shasta, California. Crystal clear blue sky beckoned to me as I drove to the trail head for a modest day hike on the flanks of the 14,000-foot peak. Many others had parked and were out walking. At first glance, there was just an inch or two of new snow dusting the trail — no problem. But as I got farther out from the trail, across the open landscape, the snow got that much deeper. I still wasn’t worried. Though I had planned a loop hike, I could always just follow my tracks back the way I came. But that’s where things got dicey — the wind was blowing and blew over my tracks. Suddenly I had no idea where the trail was. However, my saving grace was bringing a map and compass with me. Able to orient myself by using the mountains and the sun’s direction, I figured a way back cross-country to the main road. Still, as I traversed the ridges up and down, I felt fear wash over me, hoping my navigational skills were up to snuff. I breathed a sigh of relief, as I spotted the main road. Whew — I would be ok, feeling giddy as I walked the last two miles along the road back to my car. This is the challenge facing many early season hikers in the mountains of the western U.S. Perhaps none so challenging as the Pacific Crest Trail during this record-breaking snowy winter of 2017. 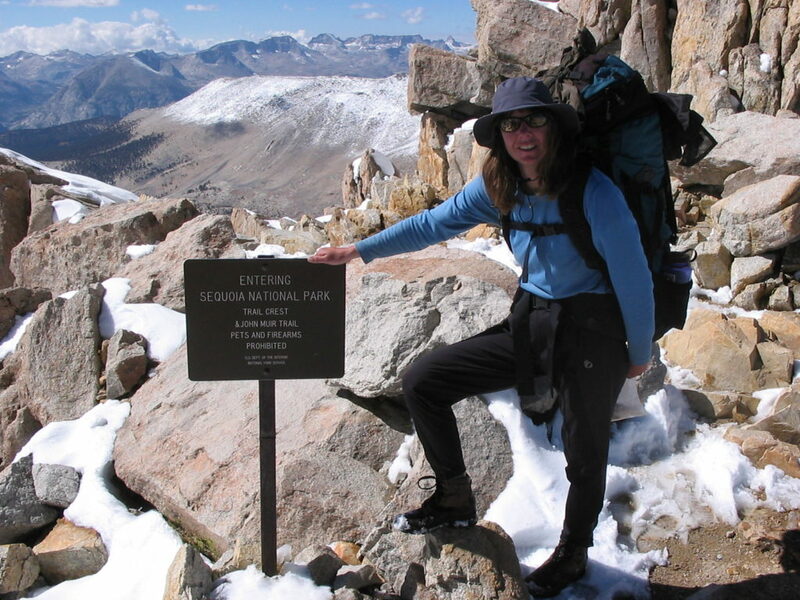 Since the book and movie, Wild, came out, more people than ever are drawn to hiking the PCT, including my cousin, a lover of hiking and the outdoors hailing from Pennsylvania. She is starting a through hike this week with her friend at the terminus in Campo, California at the the Mexican border. Reading her facebook posts, and exchanging messages from her, I can sense her excitement in preparation for her big adventure. But I worry for her and all her fellow hikers this season, because of the challenges of hiking through immense amounts of snow in the High Sierra. Hiking the PCT is a battle against a small window of time. A window of time that will allow you to get through the mountains of the Sierra late enough to not hike through deep snow and deep water crossings, but early enough to get through the Cascade Mountains of Oregon and Washington before the snow begins to fall in autumn. The last several years have lulled hikers into thinking this was a simpler task due to drought conditions that made the Sierra easily passable during early summer. But not this year. With Mammoth Mountain reporting a base (that’s snow on the ground) of over 20 feet, it will be no easy feat, and could be downright dangerous for hikers not familiar with these kind of hiking conditions. Hiking through deep snow requires using crampons, familiarity with an ice axe, as well as excellent orienteering skills. And warming temperatures in the afternoon will mean post holing up past your knees, a grueling and exhausting way to hike. A hike through deep snow can take up to three times as long as normal. A fancy iPhone or GPS won’t do you a bit of good when you are above timberline on a 13,000-foot pass with snow as far as the eye can see. The worst thing that can befall a hiker is simply following the tracks of others, who like sheep going off a cliff, also don’t know where they are going. The way through these kind of conditions is good old-fashioned orienteering with a paper map and compass. Taking readings using the map, getting a compass bearing and going point to point. I’m not the only one who fears calamity this year on the PCT. Seasoned Sierra hikers have already talked of higher than normal search and rescues, and foresee more problems as more hikers set out on the trail. For my cousin’s sake, I hope she and her friend sharpened their navigational skills and brought the right equipment. And barring that, I hope she and others have the good sense to bail out if the circumstances call for it.